Maison Bouachon dates all the way back to 1898 when it was founded by the Bouachon family. 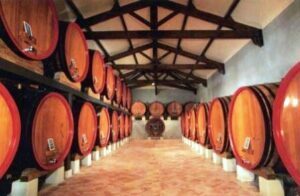 By that time the Bouachon family were already well versed in the wine trade as they successful coopers producing some of the best French oak barrels for wine makers in the Rhone Valley. Maison Bouchon also created a successful negociant firm. The entire Bouachon company changed hands in 2001 when it was purchased by Skalli Family Wines. The Bouchon family continues to manage the winery and the negociant firm today. Maison Bouchon produces and markets a wide range of wines from the Southern Rhone Valley from a myriad of appellations, not just Chateauneuf du Pape. In Chateauneuf du Pape, they produce Caves St. Pierre and Maison Bouachon. Maison Bouachon produces 2 red wines and one white Chateauneuf du Pape wine. Maison Bouachon La Tiara du Pape is produced from 60% Grenache, 30% Syrah, 7% Mourvedre and 3% of assorted grape varieties. The grapes are destemmed. The wine is aged in a combination of old foudres and used oak barrels for 12 months before bottling. On average, the production is close to 3,000 cases per year. Maison Bouachon Dedication is produced from a blend of 60% old vine Grenache, 20% Syrah and 20% Mourvedre. The wine is aged in used, French oak barrels for 12 months before bottling. The production is on average, 500 cases per year. Maison Bouachon La Tiara du Pape Blanc is made from a blend of 60% Grenache Blanc, 20% Roussanne, 15% Bourboulenc and 5% Clairette. The wine is aged for 6 months on its lees in a combination of oak barrels and tank. Maison Bouachon can be enjoyed on the young side. Young vintages can be popped and poured, or decanted for about 1 hour, give or take. This allows the wine to soften and open its perfume. Older vintages might need very little decanting, just enough to remove the sediment. Maison Bouachon is usually better with 2-4 years of bottle age. Of course that can vary slightly, depending on the vintage. In the best vintages the wine should be consumed within 3-8 years after the vintage. Maison Bouachon is best served at 15.5 degrees Celsius, 60 degrees Fahrenheit. The cool, almost cellar temperature gives the wine more freshness and lift. Maison Bouachon is best served with all types of classic meat dishes, veal, pork, beef, lamb, duck, game, roast chicken, roasted, braised, stewed, and grilled dishes, sausage, cassoulet, eggplant and tomatoes. Maison Bouachon is also good with Asian dishes, hearty fish courses like tuna, mushrooms, pasta and cheese. The white wine of Maison Bouachon is best served with a myriad of different seafood dishes, shellfish, crab, lobster, sushi, sashimi, chicken, pork and veal, as well as Asian cuisine and cheese. Maison Bouachon also produces wine from several other, Southern Rhone regions including: Gigondas, Vacqueyras, Tavel, Muscat de Beaume, Ventoux and the Cotes du Rhone appellation. Medium bodied, this Grenache dominated blend is soft textured, fresh and easy to drink, with its sweet, cherries and spicy charm. This will be fine to drink on release. Medium bodied with a strong spicy quality, there is a touch of dryness in the red berry finish. Fresh herbs, red fruits and a medium bodied soft wine with some dryness in the bright finish. Old school, traditionally styled, slightly rustic in nature, with black raspberries and garrigue that is best drunk on the young side. Made from a blend of 80% Grenache, 10% Syrah and 10% Mourvedre.